Most students will submit their applications for admission before applying for financial aid (so you actually apply to college without necessarily knowing exactly how much each college is going to cost). And a lot of families fixate so much on the admissions deadlines that they aren't aware of what they'll need to do to apply for aid. If you're a senior (or the parent of one) who wants to apply for financial aid, here are a few things you should do now. 1. Visit the financial aid sections of your colleges' websites. 2. Find out exactly what forms (FAFSA, profile, or school-specific) are required and when they're due. 3. Look for information about other requirements, like submitting business statements or providing step-parent information. You want to enter the new year knowing exactly what you'll need to do to apply for financial aid and when you'll need to do it. Getting that information ahead of time will make the process of actually applying faster, easier, and less stressful. Former high school counselor and continuing fellow inhaler of college admissions information, Cyndy, sent me this site. I haven't tried it myself, but Cyndy has found it to be an "amazing resource" that she wishes was available when she was still counseling kids. And I've recommended the book Paying for College Without Going Broke here before. The 2011 version has now been released and there are a few disappointed reviewers on amazon.com who noticed that the book no longer includes the worksheets for calculating your EFC (Expected Family Contribution) using the institutional methodology. 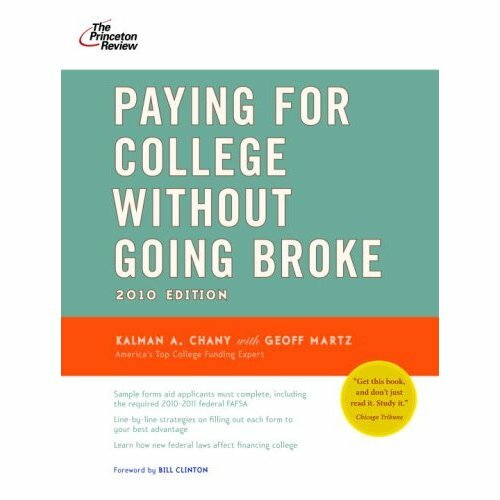 I suspect this was due to in part to the protracted publishing process–maybe the newest information wasn't available when the book went to print?I'd still recommend the book as one of the best guides to understanding how financial aid really works. And to calculate the EFC using the IM, just go here (finaid.org is my other favorite financial aid resource). I've shared the site finaid.org here before as a treasure trove of great financial aid information. But this is one of those sites with so much information that it would be easy to spend a lot of time there and still overlook a tool or article that might have been exactly what you needed. Thankfully, they offer a great site map here. Spend five minutes scrolling through the list and you're guaranteed to find exactly what you're looking for. You know a financial aid site is comprehensive when they even include a specific section with jokes. I can't say that I knew there was such a thing as jokes about financial aid. Should parents talk with your kids about college costs? When I did one of our "Financial Aid and Scholarships" seminars for our Collegewise parents last weekend, I asked them to leave the kids at home. I want parents to feel comfortable asking questions about financing their kids' educations without the added pressure of having the students in the room. But that doesn't mean parents shouldn't talk with their kids about college costs. A lot of parents believe that they should shield their kids from the economic realities of attending college, that it's a student's job to get accepted and a parent's job to pay for it. But I think that parents should have honest, open discussions with their kids about college costs. High school kids should know what their family can afford to pay for college, and what colleges will be off the table if financial aid doesn't cover the rest. Kids should know the efforts parents have made to save for college and the continued sacrifices you'll be making during the four years you have to write tuition checks. Having that conversation now, however unpleasant it might be, is much better than having it later when a student has an offer of admission in hand but a family doesn't have the money to pay for it. High school students who understand the realities of college costs for their families are more likely to appreciate that a college education is a gift, no matter what school they end up attending. And once those kids get to college, they'll understand the financial and emotional investment their parents are making. They'll be more likely to drag themselves out of bed for that 8 a.m. psychology class. They're more likely to appreciate all the opportunities for learning, growth and fun that are available to them during their college careers. So parents, consider having the college financing talk with your kids. Invite them to participate in the discussion. A student who's mature enough to attend college is mature enough to know what it's going to take for her family to pay for it. I did a financial aid seminar for our Collegewise families last weekend and talked a little about "outside scholarships," which are little-known awards or scholarships from private companies and foundations. Families are often given the impression that there is a lot of money available from these sources if you're able to find it. But according to Paying for College Without Going Broke, the money from outside scholarships accounts for only about 5% of the aid that is available. The author points out that the biggest chunk of scholarship money comes from funds provided by the federal and state governments, and from the colleges themselves. So, is applying for outside scholarships even worth a student's time? It's not an easy question to answer. Even if the amount of money available is comparatively small, free money for college is always a good thing. So here's how I recommend families consider that question. Applying for outside scholarships is a time consuming process. Kids have to research and find the scholarships, fill out the applications, and often write essays, get additional letters of recommendation and maybe even interview. So, let's say your student took the time to find and apply for 20 outside scholarships and won $500 – $1000. Would you think it was worth your student's time and effort? If your answer is, “Of course! ", then you should consider having your student apply for outside scholarships. If, on the other hand, you'd feel like a $500-$1,000 return on your student's investment of time and energy just wouldn't be worth it, you might reconsider and have your student spend her time studying and playing on the soccer team. Of course, my figure of $500-$1000 is an arbitrary one; your student might win more or less than that. But our experience with our Collegewise students has been right in line with the logic in the aforementioned book; the biggest awards don't come from the outside scholarships. In fact, I can't recall ever hearing that one of our students won a $15,000 scholarship from a private foundation or company, but we see it happen all the time from the other sources, particularly from the colleges themselves.